HOLLYWOOD, LOS ANGELES -- A rookie Los Angeles firefighter helped convince a man who threatened to jump off an overpass in Hollywood to safely surrender after causing the closure of the 101 Freeway Tuesday night. 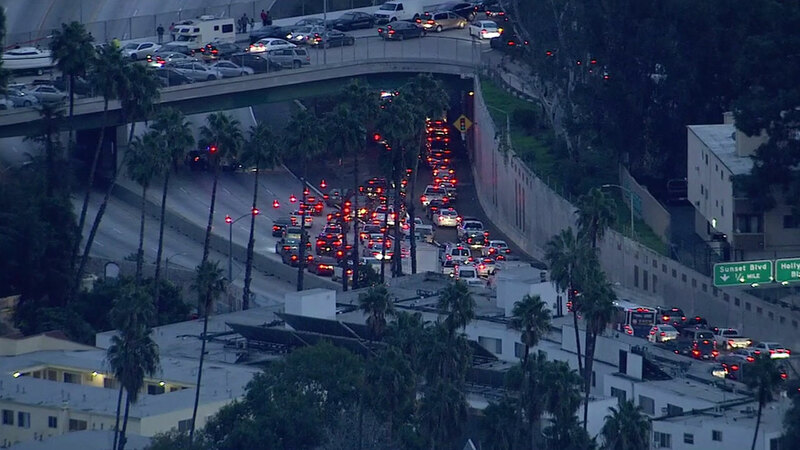 Around 5 p.m. a person was spotted on the overpass, leading to closures at the southbound 101 Freeway and Hollywood Boulevard and the northbound side at Sunset Boulevard. The Los Angeles Fire Department said a rookie firefighter, Kenneth Fraser, was off-duty and heading home when he was pulled off the freeway. Authorities said he noticed the man on the overpass. The rookie then stopped his car and went to go speak to the man, authorities said. Fraser continued speaking with the man, eventually convincing him to climb back over the side of the overpass. The man was taken into custody for a mental evaluation. The fire department said Fraser has been on the job for less than four months. Both directions of the freeway were reopened a little after 6 p.m.